Tips to Help Prevent Accidental Falls - Pro Wash LLC. It is very important to keep stairs, walkways and wheelchair ramps clean. 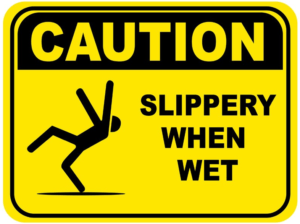 Slips, trips and falls make up 15% of all accidental deaths, which ranks them 2nd, behind motor vehicle accidents. The pedestrian access to homes and businesses usually consists of stairs, ramps or walkways. Some commercial or institutional facilities have more than one of these pathways to accommodate handicapped individuals. Let’s take a look at each and go over the benefits of keeping them free of debris and contaminants to help prevent accidental falls. Have you ever noticed that when winter weather hits, most car accidents happen on steep hills? A wheelchair ramp that has mold or other organic growth can be just as slippery as ice! A ramp may have relatively good traction when it is dry, but as soon as it gets wet it can become very dangerous to traverse. Most wheelchair ramps are constructed from wood or concrete, both of which will become excessively slippery if not cleaned properly on a regular basis. Keeping the ramps clean and unobstructed will offer your guests a safe way to access your establishment, and reduce the chance of a slip and fall situation. Shoes are the main culprits to blame for dirty and slippery stairs. Everything from spilled ice cream to motor oil is deposited on the tread of the steps by people’s shoes. Once again, add water into the equation and stairs become very slippery. Pressure washing concrete stairs with hot water will emulsify the oils and help restore the traction of the stair tread. Wood or metal stairs can also be cleaned and restored to their intended friction level. Besides keeping walkways free of clutter and debris, the surface that is walked on should also be pressure washed on a regular basis. The high level of traffic in these areas will leave the floor very dirty, which can lead to a dangerous situation. Senior citizens and young children have a higher risk of slipping while walking on low traction surfaces. Beverage spills, foot traffic and chewing gum are just a few of the causes of a slippery walkway. Pressure washing in high traffic areas is often overlooked, but it is one of the most cost efficient ways to reduce liability at your home or business. 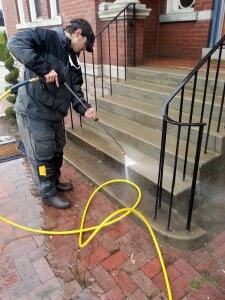 Most stairs, ramps and walkways will also be more aesthetically pleasing after a thorough power wash.
Safety and accessibility should be a high priority for any establishment. Keeping stairs, wheelchair ramps and walkways clean will help keep first impressions up and onsite injuries down. 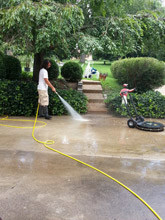 For a free consultation or quote on your entrance way cleaning, call PRO WASH,LLC at 615-999-0104 or visit our website at www.ProWashNashville.com.